iOS has some incredible music capabilities. It’s the one area that I think it excels over android and blackberry. The fact that you can connect midi and or usb midi controllers is a definite plus for any keyboardist. I’ve personally worked with quite a few piano apps over the past few years. I wanted to share my top 5 list and why they are so great. Beatmaker is by far one of my favorite apps for creating music. The sound quality of the pianos and synths are really excellent and it has all the general midi sounds you would need to make great music. It not only has a keyboard sample, but it also has a built in drum machine with “pads.” My favorite part of Beatmaker 2 and why it makes the top of the list however is the ability to insert FX on individual tracks. It has all the basic effects you need and they have a nice sound. It of course works with midi, which makes it great to use with controllers such as the Korg Nanokey. I love the fact that the iPad will power the nanokey as well. Combined with Beatmaker 2 it’s a very powerful mobile solution without needing extra power adapters or plugs. Beatmaker’s synth has a nice pitch wheel, a double layered keyboard, and the very nice option of “glissando or scroll.” I love to use the nanokey for my right hand, and the actual iPad for my left bass hand on piano. Beatmaker also has a great feature for learning which overlays the notes on the keys. Yep. You can’t have a list about music and iOS without including garageband. The synths all work with midi, it has great sounds, a standard general midi library and great recording features. It too has it’s own drum kits, bass, guitar, etc. I especially love the “smart beat” feature which allows you to automatically create drum beats based off a grid. 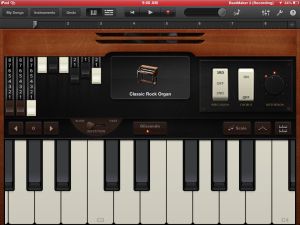 The organ is really nice in Garageband as well. It’s rotary feature and skeumorphic design is actually one of my favorite features. Many people dislike skeumorphism, but in this case it really gives you a graphical sense of a leslie. EVERY keyboardist loves a great leslie preset! I also love the distortion dial which allows setting the amount of distortion to the organ and the drawbars. In this case, the skeumorphic design is perfect. The reason I placed Beatmaker 2 over Garageband is simply the fact that it has great effects. At $4.99 it is a gimme for any keyboardist. SampleWiz is by far one of my favortie apps. It was created by Dream Theater’s keyboardist Jordan Rudess. It too works with midi and the iRig. I love the large keys and the “spacey” animations. It’s one of the best sampler’s I’ve found for iOS and it has a ton of options to manipulate the audio frequency. The simplicity of creating sample’s that work with a keyboard is astounding. If you have a good mic connection you can really create your own presets and sounds. Add in the fact that you can “sample a sample” it really let’s you get creative. You can create a riff, sample it, and then re-sample the sampled riff. Make sense? Think Pink Floyd’s “Time” intro. The sample editing feature is really a nice touch as well. It allows very precise editing of your samples so that the starting point can be adjusted. It of course senses the “start” to a wav for you, but if micro adjustments are needed, you can make them. Throw in the fact that Jordan has loaded in some of his custom presets and you have a unique musical experience. 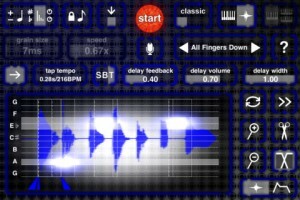 It’s definitely one of the best apps for any keyboardist or musician. 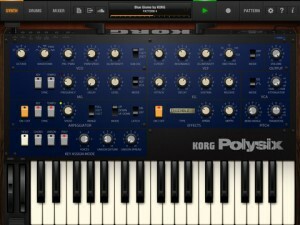 If you like classic analog synth’s, Korg’s iPolysix is the best app you’ll find. It has more dials and synth features than you know what to do with. It’s a bit on the steep side of the price range for an app, but it’s worth it if you love synths. It too works with midi. It has a great mixer feature as well which really allows you to fine tune your synth’s sound. Korg has really put the time into making it sound great with a plethora of options. A unique feature is it’s soundcloud integration. This allows you to easily share your tunes and allow some social integration since it allows users to comment directly on your track. I immediately was drawn in by Korg’s stunning skeumorphic graphics as well. Music is really a category where skeumorphism works. 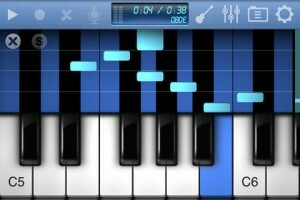 At $0.99 “50 in 1 Piano” is a great app with a lot of great features. The sound quality is on par with Garageband and Beatmaker. It also has a lot of editing features which allow you to create some unique piano sounds. 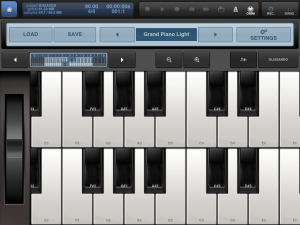 I chose it over some of the other “synth” type apps just for the fact that it really focuses on piano. It has built-in effects and a lot of options for editing sounds and presets. It has a really nice reverb “rack” that gives you ample control over your reverb. It too works with midi which allows you to use an external keyboard controller. I love the sound quality and the large keys. It also allows a dual layered keyboard through an option. I really like the record and playback feature which allows you to see the notes played as their recorded. In this way it sort of emulates an old player piano. It’s not the best piano app for iOS, but for $0.99 it is one of the best deals.